As wildfires devastate regions of California, the impacts of climate change couldn’t be hitting much closer to home for Governor Jerry Brown while he gears up to host the Global Climate Action Summit in September. While the Governor has been a long-time champion of ambitious and innovative approaches to tackling the problem, he has sidelined one critical piece of the puzzle: He has not yet advanced any policies to confront and address California’s own fossil fuel production. In fact, since he took office in 2011, Governor Brown’s administration has issued more than 20,000 permits for oil companies like Chevron to drill new wells in California. Ignoring fossil fuel production is like trying to solve the climate crisis with one arm tied behind your back. We need to address both supply and demand if we are going to wind down fossil fuels in line with what it will take to meet the Paris goals. The latest voices to call on California and Governor Brown to tackle fossil fuel production are six Nobel Peace Laureates (Spanish version here). These laureates add their voices to calls from local California elected officials, scientists and academics, a massive global civil society coalition, and grassroots and frontline communities in California. 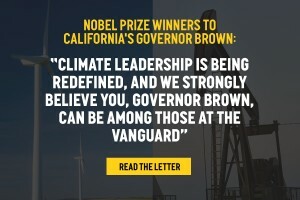 Climate leadership is being redefined, and we strongly believe you, Governor Brown, can be among those at the vanguard. We know the vast majority of fossil fuels must be kept in the ground. Climate leaders can no longer explore for and exploit new fossil fuels, and climate leaders must have a plan to phase out production by no later than mid-century. Decades after beginning to understand and tackle climate change through policies that primarily address fossil fuel demand and consumption (i.e., efficiency measures, carbon pricing, electrification of transportation, etc. ), the tough reality is that emissions are still rising globally and safer temperature limits are becoming harder and harder to meet. We urgently need a comprehensive approach to the problem. We need all of these critical demand-side measures AND complementary measures that limit supply and production. We need governments and decision makers to stand up and say “no” to the fossil fuel sector. Countries like France, New Zealand, Costa Rica, Belize, and Ireland are all setting precedents by beginning to implement various policies that aim to end fossil fuel exploration and expansion and manage the decline of production. We need more regions to follow suit. The Laureates also offer their support for a letter sent to the Governor by over 800 civil society organizations as well as for the Lofoten Declaration, both of which call for a just transition and managed decline of fossil fuel production starting with leadership from wealthy jurisdictions like California. Read the full letter here and the press release here. Visit www.BrownsLastChance.org for more on the campaign to demand real climate leadership from Governor Brown in the lead up to the Global Climate Action Summit. You can also check out the recent report from OCI and allies, The Sky’s Limit California: Why the Paris climate goals demand that California lead in a managed decline of oil extraction.